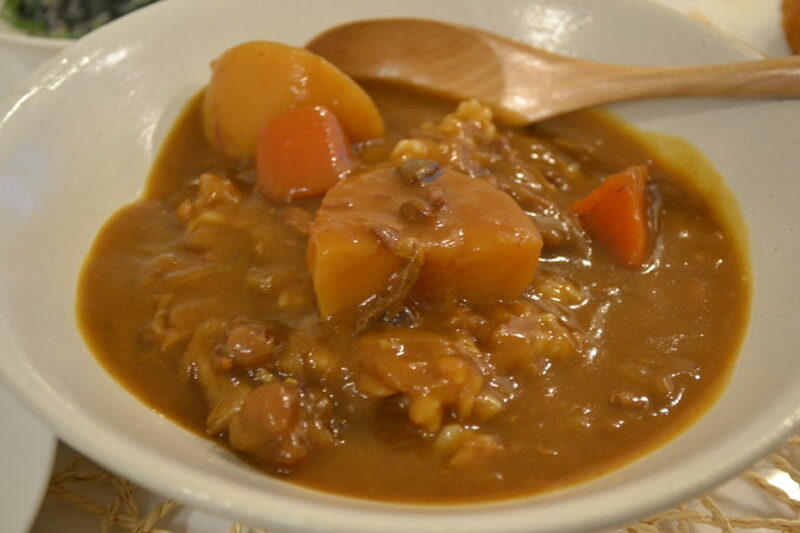 Japanese curry is one of the most popular home meal for everyone! Japanese curry is thicker than Indian or Thai curry. And the taste is milder and rich in flavor. The thick consistency makes it easier to eat with rice. “Gyusuji”, fibrous part of beef is used in my recipe. My family members like it very much because it is so tender and melt in your mouth. You can use chicken or pork for substitutions. First, Let’s prepare the meat. Let it boil for 5 minutes and discard the scum. Wash under the running water, then transfer to a pressure cooker with green onion, a few pieces of the skin of ginger root, 1/4 cup of sake or white wine, and water to just cover. ※These ingredients remove any unpleasant smells. Put the lid on and set the “weight.” Turn on the heat to medium, when it comes to a boil, turn the heat to low and cook for 10 minutes. Follow your pressure cooker instruction and adjust the time. If you don’t have a pressure cooker, cook on medium-low heat for 2 hours, or until it’s folk tender. Leave it until the pressure is released. Chill and skim off the excess fat. Discard the green onion and ginger skin. Cut into bite size pieces and reserve the boiled water. While cooking the Gyusuji, prepare the caramelized onion. Please check the previous post. It will take only 10 minutes and you will get the best result. Meanwhile, prepare the vegetables. Peel and cut the carrot and potatoes. Mince the garlic and ginger root. Everything goes into the pot of caramelized onion. Add Gyusuji boiled water and fresh water and cook until the vegetables are tender for 15 to 20 minutes. Turn the heat off and add the roux. The amount of the curry roux is on the package. Put the lid on and let it soften for five to six minutes. ※Mix 2 kind of box curry to make tastier curry. After that, turn the heat to low and stir to dissolve. Simmer for about 10 minutes or until thicken evenly and it’s done! I recommend to let it cool to room temperature and reheat before you eat. Ladle curry over hot steamed rice. I like to serve with some condiments. Pickled vegetables are essential. A soft boiled egg is a must to me. This is so good! Curry will last for a week in a fridge. I make it when I have to go out for a meeting or so in the evening. My family is happy even I am not in a house if they have curry rice:-) Give it a try!